As of August 2018, the Radisson Collection Hotel, Old Mill Belgrade began a new chapter, as the latest addition to the premium lifestyle collection of exceptional hotels by Radisson Hotel Group. The rebrand marks the property’s elevation to Radisson Collection that features some of the most outstanding hotels around the world. Each hotel is truly one-of-a-kind, distilling the best of its location through interior design, exceptional guest amenities and the expertise of its people. Situated in prestigious locations across the world’s foremost destinations, each Radisson Collection property is designed to support a contemporary way of living. True to this philosophy – and like all members of the new collection – the Radisson Collection Hotel, Old Mill Belgrade delivers a range of exceptional guest experiences across dining, fitness, wellness and sustainability. “It’s a great honor to be part of these one-of-a-kind Radisson Collection properties and to introduce this new brand to the Serbian market. This rebranding represents an important step towards the future development of our hotel and we are committed to maintaining our distinctive character while providing exceptional service and building strong relationships with our guests and partners,” said Gabriela Ditetova, General Manager of Radisson Collection Hotel, Old Mill Belgrade. Located downtown, Radisson Collection Hotel, Old Mill Belgrade is a natural fit for a collection which celebrates individuality. Close to the banks of the Sava River, in the beautifully preserved, 19th Century Old Mill (Serbia’s first steam mill, and a state-protected cultural heritage monument), the hotel is an iconic property with a rich heritage. Still more notable, however, is the hotel’s distinctive design scheme, which reflects and amplifies its unique character. As the city’s first design hotel, its industrial-chic aesthetic – a contemporary interpretation of the property’s commercial past – has seen it awarded numerous international design and hotel awards. Designed by the critically acclaimed Graft Architects, the hotel’s 230 rooms and suites are characterized by earthy tones, natural materials and iconic design pieces. Its guest rooms feature unique floor-to-ceiling wall paintings by Strauss & Hillegaart, alongside a number of premium amenities, ranging from the Radisson Collection Sleep Experience to high-spec bathrooms, high speed Wi-Fi and TV streaming. 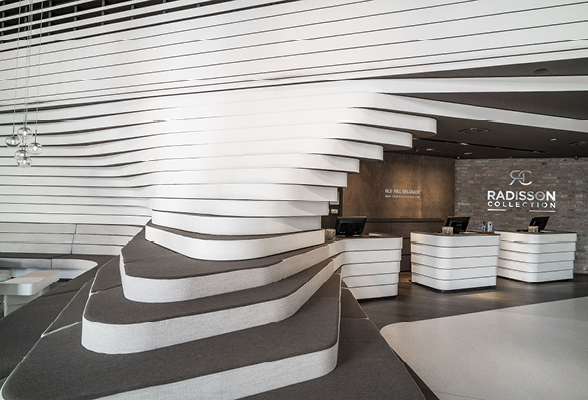 As part of a hotel collection that refuses to constrain its members with a formulaic approach to hospitality, Radisson Collection Hotel, Old Mill Belgrade offers a number of meaningful local touches, which emphasize its affinity with the locale. At OMB Larder, guests can immerse themselves in Serbian culinary culture by enjoying modern cooking techniques infused with local flavor. The restaurant’s seasonal menus are shaped by a dedication to sustainable ingredients and a zero-kilometer commitment, all of which guests can sample in a sleek interior of industrial design and soft mood lighting. At OMB Lounge, drinks are crafted by one of Serbia’s leading mixologists, reinforcing the hotel’s dining and drinking offer as a destination in its own right. True to the group’s Yes I Can! service philosophy, guests of Radisson Collection Hotel, Old Mill Belgrade can expect staff who deliver extraordinary attention to detail and an exceptional knowledge of the destination. Together with its locally curated art programs, focus on hyperlocal sustainability and helpful recommendations on exploring the best of the city (such as the Running Collections initiative and Local Delights restaurant list), the hotel offers an authentic experience of Belgrade both inside and outside its walls. Radisson Collection Hotel, Old Mill Belgrade will be operated by Radisson Hospitality AB under an international management agreement. For more information, please visit www.radissoncollection.com/en/old-mill-hotel-belgrade. The Radisson Collection™ is a premium lifestyle collection of exceptional hotels located in unique locations. The character of each Radisson Collection hotel feels authentic to its location and offer the ultimate template for contemporary living – united by modern design and exceptional experiences across dining, fitness, wellness and sustainability. Designed for guests and locals alike, each Radisson Collection hotel is defined by guests who visit them and those who serve in them. All hotels are situated in prestigious locations, close to prime leisure attractions. Guests and professional business partners can enhance their experience with Radisson Collection by participating in Radisson Rewards™ (formerly Club Carlson℠), a global rewards program that delivers unique and personalized ways to create memorable moments that matter to our guests. Radisson Collection is part of the Radisson Hotel Group™ which also includes Radisson Blu®, Radisson®, Radisson RED®, Park Plaza®, Park Inn® by Radisson, Country Inn & Suites® by Radisson and prizeotel. Radisson Hotel Group™ is one of the world’s largest hotel groups with eight distinctive hotel brands, more than 1,400 hotels in operation and under development around the world. Radisson Hotel Group portfolio includes Radisson Collection™, Radisson Blu®, Radisson®, Radisson RED®, Park Plaza®, Park Inn® by Radisson, Country Inn & Suites® by Radisson and prizeotel. Radisson Meetings place people at the heart of everything we do and treat every meeting or event as more than just a date on the calendar. Designed around three key commitments – Personal, Professional and Memorable – delivered through bespoke services, Radisson Meetings create successful and unique experiences for our guests.